Damon Runyon had a great ear for names. Sky Masterson, Nathan Detroit, Nicely Nicely Johnson… Part of the fun of reading his short stories, or watching Guys and Dolls, the Broadway show based on his works, are the monikers and the characters who sport them. Whether via page, screen or stage, Runyon-land, his imaginary version of Broadway filled with covert gambling, bent cops and hapless missionaries, is always worth the trip. Guys and Dolls is the story of Nathan Detroit (Shane Cortese) and his pal Sky Masterson (Roy Snow), a couple of veteran gamblers — Nathan runs a floating illegal craps game which he is constantly trying to hide from both the irascible copper Brannigan (Stephen Lovatt) and his long suffering finance/doormat Adelaide (Sophia Hawthorne). Sky is the exact opposite — an archetypal lone wolf, with no broads and no fuzz on his tail. He’s free as a bird, until a bet with Nathan pitches him into a whirlwind courtship with Sarah Brown (Rachel O’Connell), an idealistic member of the local missionary. Full disclosure — I have never seen ‘Guys and Dolls’ before. I had seen part of the movie adaptation a billion years ago, but it left no impression. This ended up being a good thing, as I got to enjoy the show without having any previous incarnations to compare it against. While I wouldn’t quite call it a smash, Auckland Theatre Company’s cheery, unpretentious production makes a good go of bringing Damon Runyon’s classic band of reprobates and hardy dames to life. Directed by Raymond Hawthorne, the show looks good, the singing is strong and the whole thing moves at a good clip. It also manages the trick of getting more involving as it goes along. The jokes hit harder, the cast’s chemistry becomes more evident and Jeremy Birchall’s choreography really adds pizzazz to the songs. As far as acting goes, the supporting players run away with the show. The leads are solid, but if anyone stands out in the cast it is Andrew Grainger as one of Nathan Detroit’s (Shane Cortese)’s flunkies, Nicely Nicely Johnson. His showpiece, ‘Sit Down, You’re Rocking the Boat’, is one of the high points of the show. Geoffrey Dolan is also great as Big Jule, a visiting mobster out of Chicago who feels like a spiritual cousin to Tony Soprano. If there is one word I could use to describe the experience, it is fun. This is the definition of a good time. 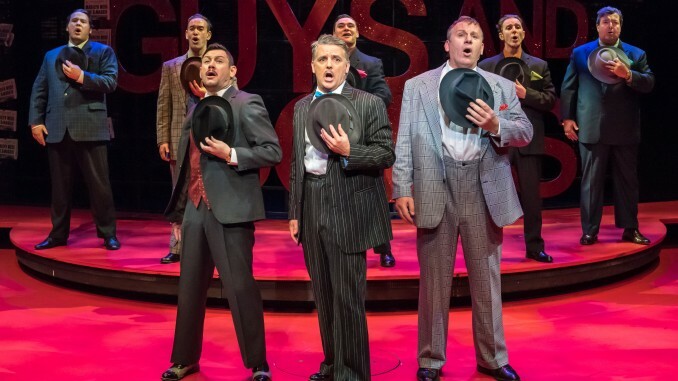 In its time the subject matter must have raised a few eyebrows, but for today’s more jaded viewer, Guys and Dolls is good, clean fun that packs enough classic tunes for your grandma and enough of an edge to make even the hardest cynic chuckle. 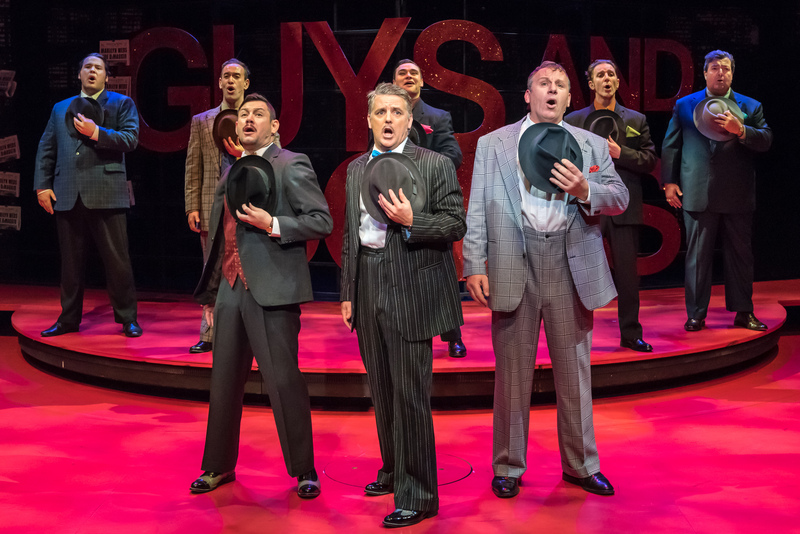 Guys and Dolls is presented by Auckland Theatre Company and plays at Q until 5 Dec. Details see ATC.